Editor’s Note: In March of 2013 the Annals of Internal Medicine added the Graphic Medicine series as part of their medical humanities features. 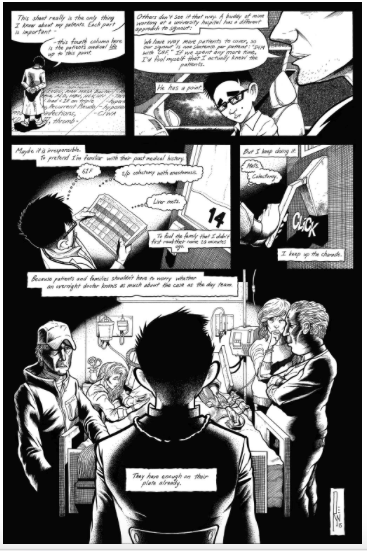 As they describe, “Annals Graphic Medicine brings together original graphic narratives, comics, animation/feature, and other creative forms by those who provide or receive health care.” Most often the stories are from a physician’s own experiences and drawn by the health professional themselves or sometimes by a collaborator. The November 2015 issue of the Annals published “Sign Out” by Ryan Montoya, M.D. I asked Ryan to talk about what motivated him to create his comic “Sign Out” and some of the comics conventions that he uses to convey complex social interactions. I want to explain my biggest fears, anxieties, and neuroses, and put them under a spotlight. At least, that is currently my goal with my comic work. I spend a great deal of time writing in my journal and refining a narrative in my head that explains what are likely completely disparate life events into a cohesive story. That narrative changes all the time, and I would like my comics to capture a version of this story at that moment. I have loved and read and drawn comics since the first grade. I knew it would always be a part of my life, and as I made my way through my medical studies it became rapidly obvious that I would be telling graphic narratives culled from my personal experiences in medicine and other fields. My artwork is heavily influenced (i.e. I’ve spent a great deal of time ripping off) superhero and independent art, whether it was the razor sharp linework and striking compositions of Brian Bolland, the real-world sensitivity and humor of Paul Chadwick, the quiet rage and clarity of Howard Cruse, the timeless grace of Will Eisner, the irreverence of Jean Girard, the scope and breadth of Otomo Katsuhiro, the observational humanity of Joe Sacco, the exciting and nervous impertinence of the Image Founding Fathers, or the hauntingly simple and profound lines of Yoshihiro Tatsumi. I’ve longed for my work to be an amalgamation of all of them. My motivation with my comic “Sign Out” was to use these various styles to depict all my fears, anxieties, and neurosis under a spotlight. This informs the style I used in the story, and which I have adopted for a lot of my recent work. Every single panel is dark, with heavy use of shadows to give weight to the characters and situations, and suggest a strong overhead light source; each character in the story becomes a performer on stage. In technical terms, I wanted the story to be as immersive as possible. Comic boards are usually drawn at a larger 11 by 17 inch scale, to appear more detailed when shrunk to standard comic book size. I prefer to draw in 1:1 full scale, so that the reader can get lost in the details with me. Most of the pages feature full-bleed art extending to the edge, with very narrow gutters, to create an immersive experience and not lose the reader’s attention. Texture is very important to me, so that almost every surface in every panel is cluttered with strakes, cross-hatching, and point stippling, so that the audience can feel each surface indelibly. It is standard for graphic memoirs to have the author narrate the story in first person, but I decided on page 2 that I wanted to break the fourth wall, in order to establish a direct empathic bond with the reader and engender trust in what I was explaining. I also thought this would be a good device to show that I am far from an omniscient narrator, but rather someone who is trying to explain what is going on in a medical interaction from this side of the exam table. My goal was not to presuppose what patients may think about interactions with a healthcare provider. It was to explain what is going on in our heads. This extended to my choice of words and what I wrote in each panel. I tend to over-explain everything, and I wanted to choose my text and writing as carefully as possible, and to economize my sentences to say exactly what I want, and leave the rest of the interpretation to the reader. 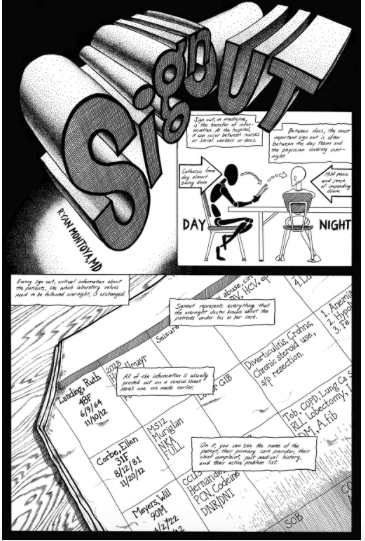 At the bottom of page 2, a sequence of 4 narrow adjacent panels assumes a comic strip format. In a comic strip, this usually indicates short, immediately consecutive chronological moments, but for this story I wanted to use this device to show a rapid montage of monotonous, arduous moments of the day, where the setting is the exact same but my clothes, questions, and posture were the only variations. I am a physically small person, and with my youngish facial appearance, I am often mistaken in the clinic or the hospital as an inexperienced child. This is over-emphasized in the story, from my largish head and tiny frame, to me looking up in the first panel of page 3—partly from still not feeling as experienced a physician as I should be, and partially in reverence to the census sheet that appears in the next panel. This feeling of being naive and unschooled extends further onto page 4 panel 2, where I am physically hunching underneath the heavy tutelage of my colleague’s advice, despite us having the exact same level of experience. Perhaps the most important idea of the story is that, as much as doctors want to present a paternalistic air of authority to a patient, it is, more often than not, a performance. I really wanted to accentuate this idea and, using strong shadows and high contrast, spot-lit areas to reiterate this. At the bottom of page 3, I discuss pharmaceutical recommendations for a patient that will soon be discharged, and the divider drape in the background becomes a metaphorical stage curtain. As I dole out my treatment plan, I strike a confident pose—I am an actor nailing my monologue. But when I realize that I have made a mistake, I deferentially crouch in embarrassment. The audience (and my patient) are witness to this mortifying pratfall on stage, the curtain still draped in the background. I wanted the idea of the doctor as a performer to most strongly be illustrated on the last page. In panel 3, I am an actor again, taking deep breaths and struggling to memorize my lines while the stage spotlight peers through a shuttered patient window. In panel 4, I get one last review of the text, and timidly walk on stage. In the last panel, another performance begins, and the silent audience is staring right at me. Ryan Montoya is a Family Medicine doctor and a comic book artist. He completed his undergraduate studies at Harvard University and his medical school and residency training in Family Medicine at University of Massachusetts Medical School. He has art training from the Massachusetts College of Art, Art Institute of Boston, Joe Kubert School of Comic Art, and the School of the Museum of Fine Arts. Image + Text is a series that engages the landscape of graphic illness narratives. What can the production of comics and other graphic forms tell us about issues of embodiment, biopolitics, or biomedicalizaton? How do our relations of collaboration and translation as interlocutor, ethnographer/artist, or ethnographer and artist work to express subjective and intersubjective moments in complex social worlds that are fraught with illness and power relations embedded in a search for well-being? Image + Text is edited by Juliet McMullin and Stacy Leigh Pigg. Montoya R. Comics and the Medical Encounter. Somatosphere. 2016. Available at: http://somatosphere.net/2016/comics-and-the-medical-encounter.html/. Accessed April 20, 2019. Montoya, Ryan. 2016. Comics and the Medical Encounter. Somatosphere. http://somatosphere.net/2016/comics-and-the-medical-encounter.html/ (accessed April 20, 2019).